Poster designed by Natalie Eilbert. Individual chapbook covers designed by Emily Raw. We are delighted to announce that our fourth-annual chapbook reading period will open up on Saturday, September 15th, and run until 11:59 p.m. on Monday, October 15, 2018. We will be open in all genres—poetry, fiction, and nonfiction. Don't worry if your work blurs the line—we absolutely love hybrids and mixes. Teaches of Peaches by Diane Exavier is one example; the forthcoming, It Was Over There by That Place by Diane Glancy, another. You ought to familiarize yourself with our catalogue prior to submitting. You might consider downloading free e-chapbooks by Mike Lala, George Abraham, and Zoe Dzunko. Better yet, check out our entire store and purchase copies of any of our available chapbooks by Soleil Ho, Megan Giddings, Roberto Montes, Spencer Williams, Diane Exavier, Linette Reeman, and torrin a. greathouse. That should help you gain a sense of our aesthetic, though we are always reading and evolving our tastes. All chapbooks must be between 20 and 30 pages in length, set in 12-point font in a Times New Roman or equivalent. This is vital because the page count of the chapbook always runs much longer than you'd expect once it's been typeset. It isn't that we don't want to publish your chapbook as a 62-page perfect-bound chapbook—it's the cost for us, and for you, it might diminish some of the appeal of your debut or second full-length publication dreams, depending on what certain publishers deem "chapbook" and "full-length." Please make sure you remove your name from the chapbook. It could really help you to do a search for your name. You never know where you pop up. For this reason, please do not include an Acknowledgments page and certainly, no bio page (even if you redact your name) (we are not interested, at this point, in your staggering merits [but hey, we're proud of you!]). Submittable cover letter—yay or nay? If you would like to include a cover letter with your chapbook, explaining the thesis and process or any other germinating details, you may do so in the Submittable cover letter field—we won't see any of that information during the screening process. Once the finalists are announced, the lights go on and we are able to see various components of the submission, including this cover letter field. Should your work be chosen as a finalist, we may end up peeking at this cover letter, especially if the work is clearly responding to a larger project. We love ambition! We are happy to consider chapbooks with images, but please do note that depending on budget, we may not be able to run the pages in 4-color. Finally, and we hope this is clear, while we are happy to publish chapbooks within which there are published pieces, the chapbook manuscript itself should not have been previously published. If there are extreme circumstances, you can email us at theatlasreview [at] gmail [dot] com. Publisher and editor Natalie Eilbert is the only person who receives these emails, which she considers confidential. Your privacy means a significant amount here. We accept between 4 and 5 chapbooks per reading period. 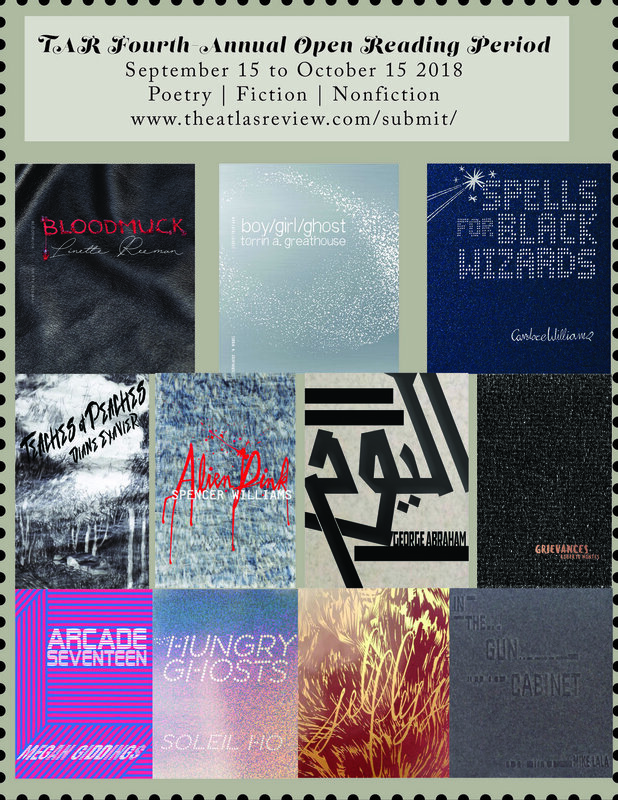 Authors of accepted chapbooks will receive $100 upon delivery of the printed books, 25 contributor copies, and endless, undying publicity forever from us, so long as we both shall live. The full print run is 125 copies. Building up to the publication of your chapbook, we will conceive of and film a book trailer, feature a sample piece from your chapbook, and interview you for our site. When your chapbook sells out, you will have the option of having an e-chapbook available for free download by any and all consumers. Follow the link to our Submittable page. Please read the guidelines of your given genre carefully, and be sure you double-check (refer to the Manuscript Prep above, if you'd like). You may notice that some options come with a submission fee—this fee is entirely optional. We made sure to present a readers fee to those who can (and want to), but it does not affect the status of your submission either way. The reason for this optional fee is to help us cover production costs, including the necessary programs within Adobe Creative Cloud, printing costs, and monthly Submittable fees. We're all writers, so we know that even if the fee is $3 (which it is), it can still be a bummer and a nuisance. Thank you so much if you choose this option! And thank you so much if you don't! We are happy to read you—that is what we are here to do. We are strong proponents of simultaneous submissions—if your chapbook is accepted elsewhere, however, please make sure you withdraw your piece via Submittable immediately—and congrats! EIC Natalie Eilbert offers this thread on Twitter about frequently asked questions. Don't see the answer you were hoping for? Email us at theatlasreview [at] gmail [dot] com!